Don’t just *buy* drunk food—sleep over at its house. Saturday night at “The Bell” goes down like this: Five vodka sodas in, you develop an acute need. More than a craving, it’s like achieving a cheesy, crunchy, beefy snack has become your new life purpose. So you gulp down your remaining drink, wipe your face on your sleeve, and take off like the Tasmanian Devil. Eyes wide with desire, you’ve got only one thing on your mind: two Quesalupas and a side of fried Cheesy Fiesta Potatoes. What if I told you you actually could stay at that beefy, cheesy Promise Land? Imagine curling up on a comfy couch with your Quesalupa and some “Seinfeld,” devouring processed beef with your hands. You wouldn’t even have to concern yourself with the irritation of patrons watching you like a creature in the orangutan exhibit. Well, that supreme contentment is available to you, my friend. But only for one day. And only if you win this contest. And only if you live in Canada. And no, Quebec doesn’t count. 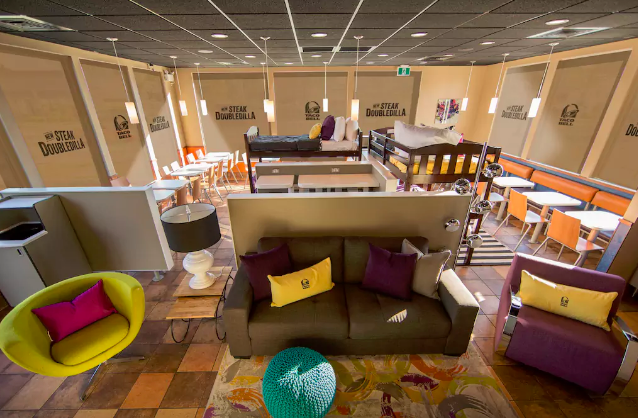 In celebration of Taco Bell’s newest creation, the Steak Doubledilla, the drunk-food empire is offering an opportunity to stay in one of its locations in Chatham, Ontario. 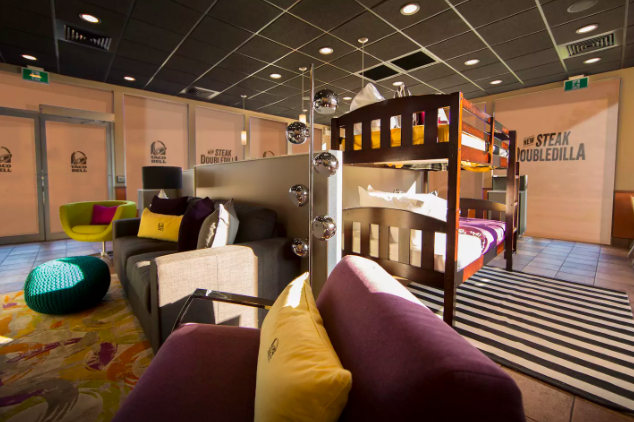 Taco Bell is teaming up with Airbnb for one night only. On Oct. 17, you could be ordering unlimited Chalupas from your own personal butler while laying in a burrito-themed bed. All you’ve got to do to live your dreams is answer one question (and live in Canada): Why do you want to take a SteakCation? Signup closes on Oct. 11 and if you’re the lucky winner, you won’t have to wait long. The champion will be announced on Oct. 13. As a US resident, I’m not eligible to participate, but it’s cool. My Saturday-night jog to Taco Bell in stilettos is my cardio. Live más.